Colour, shape, technology. Rifco World Group srl has been revolutionizing in the years the world of personalized advertising communication, giving life to the simpler and most lively aspect: the air. It's well-known, that the balloon and party industry is not only profitable but is also a fun industry to work in. This web-site is dedicated to balloon and party professionals as well as to the beginners who would like to start a part-time or full-time balloon service with a minimum investment and earn big profits on week-ends and during holidays. Just few words to summarize the goals of RIFCO ADVERTISING: satisfy every advertising need, all over the world, in the most funny and happy ways. 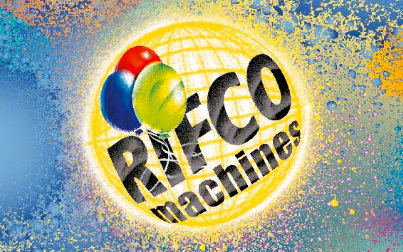 Rifco World Group has been projecting and manufacturing printing machines since 1979 and has gained a world-wide recognition as the leading balloon printing supplier thanks to its innovative ideas combined with the latest technology. 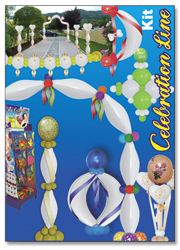 Ecommerce with party items, balloons, accessories. Colour, shape, technology. Rifco World Group has been revolutionizing in the years the world of personalized advertising communication, giving life to the simpler and most lively aspect: the air. 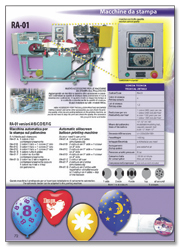 Thanks to continuous researches and to the development of innovative technologies, Rifco World Group has become a point of reference in the field of balloons’ printing, at first planning and creating an automatic offset balloon printing machine which prints the whole circumference of the balloon and then developing new printing method, new support and vanguard services. The field of printing has been more times revolutionized by Rifco World Group inventions: from the photo colour print to the shaded print, from the planning of new balloon’s shape up to the creation of a square balloon, up to the evolution of decoration and the balloon’s transformation from a simple advertising support up to an active means of animation. Nowadays Rifco World Group has been worldwide recognized for its exclusive new products. Rifco has begun its activity having a great success in the planning and the manufacturing of an offset printing machine capable of printing on the whole circumference of the balloon. 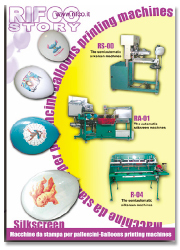 Thanks to this printer, Rifco has become world-wide known in the field of balloons. 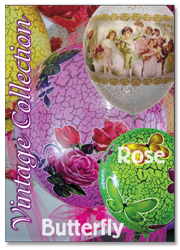 Rifco developed a method to print photos in full colour on balloons, that revolutionised the printing sector with its excellent quality and good looks. It gained a great recognition in the field of balloons at International niveau. 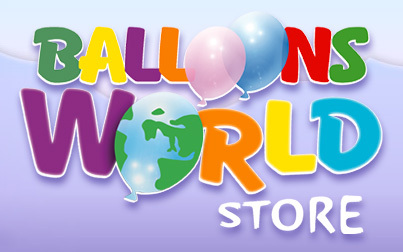 Rifco offers a printing service and delivers balloon all over the world: our company can print from 1 up to 8 colours on 4 sides of balloons and 2 colours all around. The daily printing production is 1.000.000 pieces. 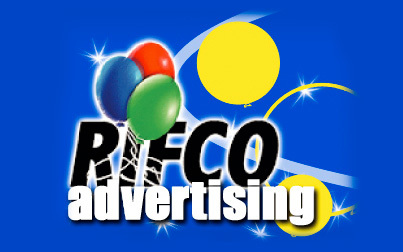 In 1998 Rifco presents a new kind of printing for balloons: shaded print all over; economic and highly effective. 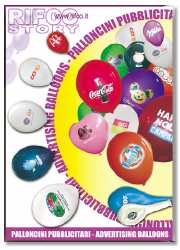 Evolution of advertising balloons! Rifco has studied how to make the balloon more and more dynamic and invented a motor, called Twist Its applications are endlessly and it can turn more balloons together at the same time, creating original decorations. 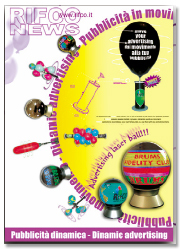 The balloon becomes a luminous sphere Laser ball, in which you can project advertising with special effects up to 7 colours. Software for Windows included. Il modello di macchina RA-01G, la macchina serigrafica automatica, stampa: 2 colori su 2 lati simultaneamente e 1 colore sul globo. La macchina è innovativa e versatile e soddisfa le maggiori richieste del mercato dei palloncini..
During last years “Rifco” has added a wide range of special decorative balloons and accessories. 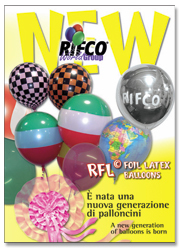 • Latex and foil balloons “RFL”. R-145 stick and cup in one piece. The stick and cup only in 1 piece lets you inflate the balloon directly in the stick and to fix the balloon’s neck very easy and very fast. • Latex balloons “Deco-Funny Arches, Links and Waves"
Balloons World Store continues to add new balloons in new decorative shapes. 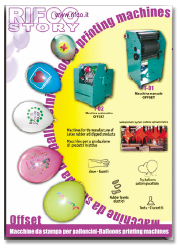 It introduces a possibility of CMYK printing on latex balloons in high quality. 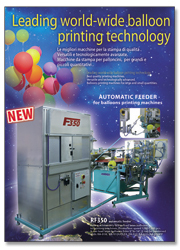 RIFCO presents the automatic feeder of last generation, fast and adaptable. Usable with all kind of latex balloons from 7” to 14”. Moreover it is possible combine it with all automatic machines Rifco models! The enthusiasm for the play and the design gives passion to the owners of the company. A great interest passed from the father Filiberto on to the daughters, also clever and active on the new products’ research. The perfection of the spherical shape reflects the efficiency and the quality offered by Rifco World Group. These features make Rifco World Group the ideal partner for the companies that wish communicate emotion, gaiety, energy. I declare that I have read informativa sulla Privacy for the processing of my personal data. Enter your email address to receive regular updates on our products and our news. from Rome: highway A1direction Napoli exit Ferentino, then follow direction Sora - exit Alvito. The journey time is approximately 1 hour and 30 minutes. from Napoli: highway A1direction Rome exit Cassino, then follow direction Sora - exit Alvito. The journey time is approximately 1 hour and 30 minutes. from Rome Termini railway station to Cassino. Once arrived in Cassino, please, give us a call. The journey time is approximately 2 hours. Capitale Sociale Euro 00.000,00 i.v.